Monday was Tax Day. If that’s news to you than you should stop reading this immediately. But if, like most of us, you paid your taxes in a timely fashion (or hastily filed for an extension) you probably caught yourself wondering over the last week just where, exactly, did our complex tax system come from? The income tax has a long, and surprisingly interesting, history. America’s first income tax began to help pay for the Civil War, expiring soon after the war’s end. We took another crack at an income tax with the passage of a flat tax in 1894, which was later ruled unconstitutional by the Supreme Court in 1895. That both Houses, by a two-thirds vote, shall propose an amendment to the Constitution conferring the power to levy an income tax upon the National Government without apportionment among the States in proportion to population. Congress passed the 16th Amendment the following month and it was ratified by 42 of 48 states in 1913. But very few Americans paid income tax for the next several decades. By 1939, only five percent of Americans, mostly the rich, paid income tax. That is until World War II. With funding needed for the war, Congress passed the Revenue Act of 1942, otherwise known as the “Victory Tax.” The act made 75 percent of Americans eligible to pay income tax. With that expanded tax base came a big question: Would ordinary Americans know how to pay their taxes? Propaganda? Yes. Effective? Also, yes. Taxes were paid promptly in 1943 and by 1945 about 90 percent of Americans submitted income tax forms. 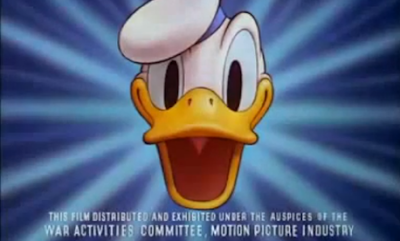 So effective was Donald Duck’s turn as IRS spokesperson that the film was nominated for Best Documentary Feature at the 15th Academy Awards.